For a woman's bathroom to be complete, a suitable shaver is a definite must have. With hair regrowth being a constant for most of us on the legs, in the armpits on the bikini area and even some facial hair for some, it is a wise move to have a reliable shaver available as and when you need it. Here is previous review on the Braun ﻿﻿﻿Silk-Epil 9 9-579 and schick hydro silk trimstyle review﻿. The Panasonic es2207P proves itself to be the ultimate shaver. Right from its shape, size, and design it is a technological marvel in every aspect. 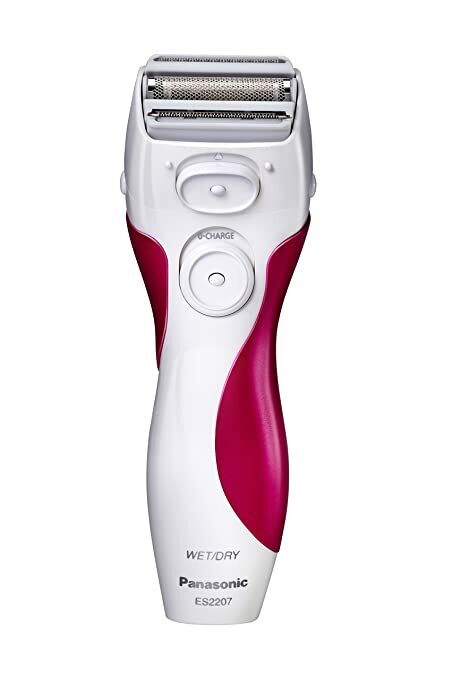 A lady's body is curvaceous in general and a perfect shaver must have the capability to navigate with ease on all the areas requiring depilation, eliminating hair in the narrowest of spaces where necessary. The ultimate close curves shaver has a white and mauve plastic covering which is designed to taper upwards which ensures that is easy and comfortable to grip. It has a on/off switch placed on the front of the shaver for easy access. It is also rechargeable and hence you have no need to replace batteries frequently. It is cordless, so still easy to use without worrying about cords being in the way. The Panasonic es2207P is designed with a three blade internal system which allows a smooth and even cut with just one pass. The three blades are very sharp and the one stroke trim ensures that overall shaving time is cut down to a minimum. The shaving head is designed to float along the curves of your skin and consequently provides a smoother, closer shave with less irritation. It also ensures that you have to go over the area less times to ensure a clean shave. Be it your arms, legs or face, the Panasonic es2207P offers an effective solution to hair removal. The three heads float independently of each other so that less hair is left behind per stroke. The heads are designed to be in close contact with the skin at all times while shaving. Even if you are shaving ﻿﻿﻿up your leg and reach the thinner and bonier curve of the knee, the shaver glides effortlessly over the sharper curves without nicking the skin or leaving behind tracts of hair. The Panasonic ES2207P is ideal for all grooming needs and can be used on dry skin if necessary as well as in shower or the bath tub. The shaver is completely waterproof and can be used with most shaving gels, soaps, shaving foams or just plain water. The Panasonic ES2207P is impervious to water and can be fully immersed, making it simple to clean as well, as you can just run it under a tap to wash everything out, shake out the excess water, towel dry on the outside and leave it to air dry on it’s own afterwards. While traveling, it is an ideal choice for shaving and trimming as it comes with a compact AC charger and a sleek travel pouch to protect the shaver. The package contains a protective cap, one cordless shaver, an AC charger, a traveling pouch and a partial warranty against any defects. Most of the men's shavers come with reliable pop-up trimmers. Panasonic was keen to introduce this versatility in their lady's shavers. The pop-up trimmer is very useful for trimming bikini hair and facial hair. The trimmer slides upwards and after use can be eased back down back into the resting position. This shaver is designed with durability as a priority. It eliminates the need to replace your shaver every few months. Bearing in mind that nickel products cause allergic reactions on many people's skins, this shaver was designed to eliminate this particular problem. The shaver's foil head is nickel free and 100% hypo allergic as it uses stainless steel instead. The shaver perfectly fits the grip of smaller hands. Its measures 6.0inches *2.0inches * 1.9inches. It weighs roughly 0.33 pounds. Panasonic es2207P's review is ultimately favorable. The shaver has taken every aspect of its particular niche into consideration making it a very reliable product, efficient and easy to use the product. With women shavers in the limelight, the Panasonic es2207 has just upped the game by a notch. The blade sets and the foil blades are all easily accessible when needing to replace the blades over time. However, many people will just opt to purchase a new shaver instead. If you are on a strict budget but still desire a perfect grooming shaver, then this is the ideal shaver for you.